It was just 2 of us this Sunday morning, a beautiful sunny day, freezing cold wind blowing a gale out of the west. Early start as usual, turning into the driveway of Cooroy Mountain Spring water at 7.10 am. One of us had called through the week to let them know we were going to hike on Sunday, so the gate was left open. If you climb through the week, you are asked to sign into the visitor's book and park at the visitors carpark near the office. We had a 4WD, so drove through the gate past the office and near the cattle yards and up the mountain track to park next to the sheer cliff face that marks the start of the walk. I would not advice driving up without a 4Wd or in wet weather, just walk the track up, it's a lovely walk. With your right side to the cliff face, walk straight for maybe 5 metres to a couple of pine trees, the track wind around the cliff face to the right and then comes to a T where you turn right. Follow this trail into the bush and up the mountain. The westerly was very cold as the climbing side of the mountain was in the shade. So a good tip: in summer climb this mountain in the early morning, but in winter an afternoon climb better. The track is still in good shape, rocky in parts, definitely not as steep as Cooroora Mountain in Cooroy. Near the top there first is a cliff face towards the west, a bit cold and windy for us, but climbing on we got to the other side of the mountain where the sun was beaming down and we were protected from the wind. On the way to the the other side you'll pass a rock and a large bird's nest fern, stuck underneath wrapped in plastic is a visitor's book (another one) . It makes a good read and of course pop your name in if you wish. 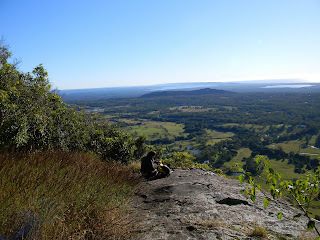 Wow, the easterly side was so warm, we stripped off, had our morning tea on a rock, what a view all the way to the coast, Noosa, the lakes, great! It was difficult to leave and start on the track back down, beanies back on all rugged up, way to go! It only took half the time getting back. Coffee in Cooroy back at Peter's Cafe. delish!